Explore alternatives to couples therapy that can make a big impact on your relationship. When your relationship is struggling, you don't have time to experiment. 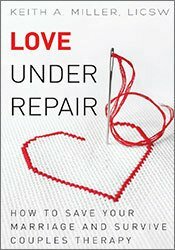 Love Under Repair is a concise, engaging resource that brings to life the "Big Three" most popular methods of couples therapy today: Emotionally Focused Therapy for Couples, the Gottman Method Couples Therapy, and Imago Relationship Therapy. Keith Miller is a licensed clinical social worker and the founder and director of Keith Miller & Associates Counseling, a private psychotherapy practice based in Washington, DC. Keith is passionate about reaching couples that need help who have struck out at previous attempts in therapy or are hesitant to consider consider professional therapy in the first place. He has shared the joys and trials of marriage, gardening, and the pursuit of excellent pancakes with his wife since 2000. They have two children.